We love blondies at our house. Gooey sugary goodness that's quick to make. My kids tell me that they bring them to school and other kids have never heard of them before. Let me introduce you to some gooey goodness, courtesy of the Better Homes and Gardens New Cook Book. First, send two kids off to rehearse the Nutcracker all day. Ask the cutie remaining at home what she wants to do. Act surprised when she says "bake cookies! Let her pick an apron to wear. She went for the cute "Cookie's diner" fabric with lots of ric rac and pockets. Set oven to 350, Grease a baking pan and heat brown sugar and butter. Stir constantly until it makes wonderful melted goo. Let it cool for a bit, so the eggs don't cook when you drop them in one at a time and stir them. Dry ingredients go in next. Stir and stir and stir. 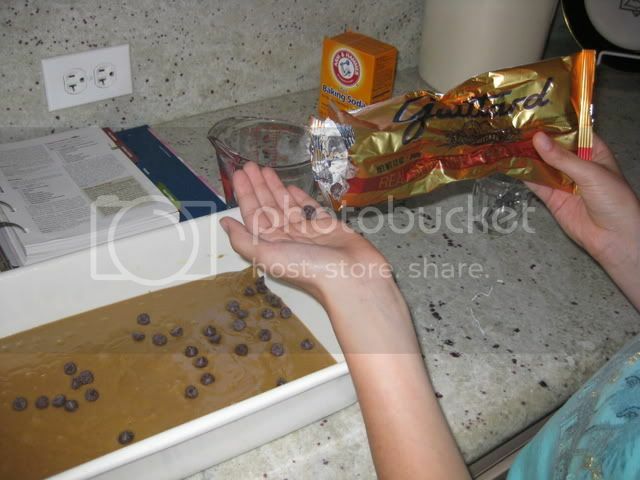 Pour it into the prepared pan and sprinkle lots of semisweet chocolate chips on top. Pop it into the oven and watch Gone With the Wind for a while. 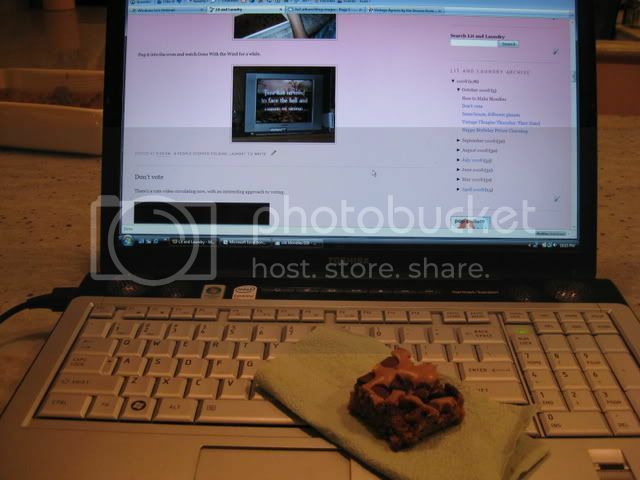 Sample the delicious result and blog about it. 1. Grease a 13x9x2 inch baking pan; set aside. 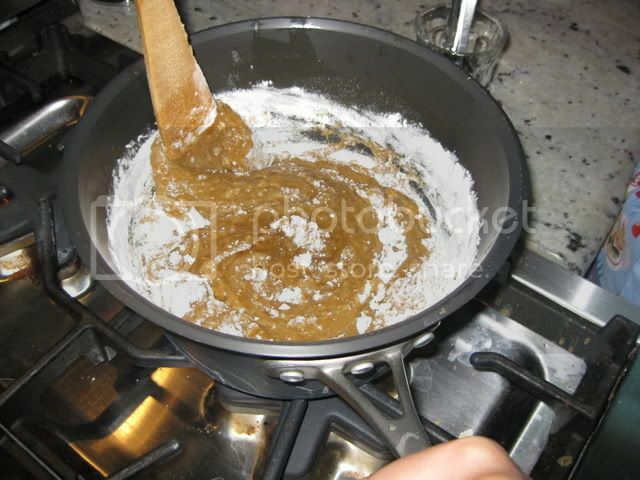 In a medium saucepan heat brown sugar and butter over medium heat until butter melts and the mixture is smooth, stirring constantly. Cool slightly. Stir in eggs 1 at a time; stir in vanilla. Stir in flour, baking powder, and baking soda. 2. 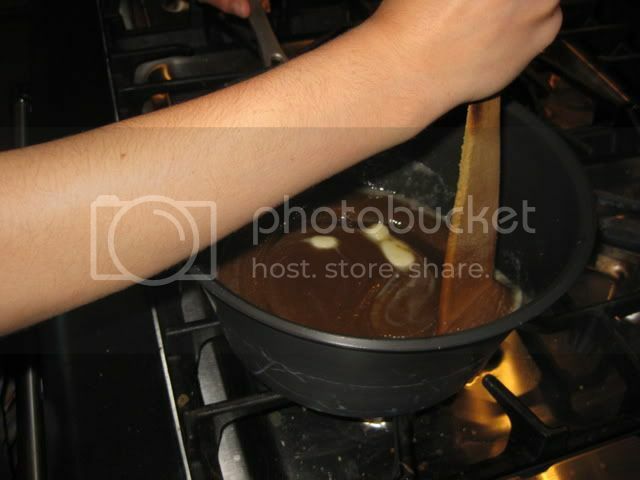 Spread batter in prepared baking pan. Sprinkle with chocolate pieces and nuts. Bake in a 350 oven for 25-30 minutes or until a wooden toothpick inserted near center comes out clean (avoid chocolate pieces). Cool slightly on a wire rack. Cut into bars while warm. Was she making brownies by any chance? 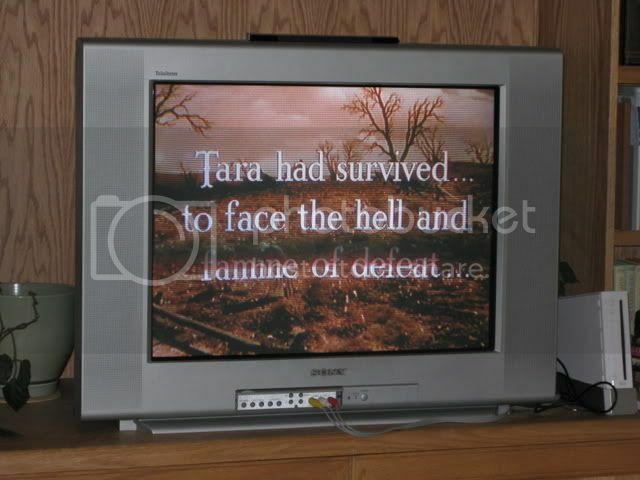 I must get the dvd of Gone with the Wind - simply one of my most favourite films! OMG she is so cute with that million dollar smile. I'll take a blondie or a brownie or anything! Sounds delicious. I think we must be realted somewhere down the line. We've been making Blondies ever since I was a child, and no one has ever heard of them here either. I have the recipe written out on a recipe card from my mother's box. OMG - i think we're related too (and we were separated at birth at which point i was adopted by my current family). i remember eating these as a child - they had this crispy/sort of shiny top, but were ooey gooey underneath. however, nobody in my family has any recollection of these nor do they have the recipe! thanks for sharing. i am going to make these for my lil man to take to daycare on halloween! jules (who wanders over here from What a Card's blog). Baskin and Robbin used to have Blondie ice cream, which of course was my favorite. Can I just say I am so glad you two didn't need to face "the hell of famine and defeat"? ;) Those look like some tasty blondies! Your daughter and her apron are too precious. Ha! I thought this was going to be a blog about genetics! Perhaps it's because I'm very blonde and have two dark haired boys. I get so many comments about how they don't look like me. I would have welcomed a blog entry about how to make lil' blondie kids so people could understand that when you mix a dark haired daddy with a blonde mommy, that dark hair is going to win most of the time! Having said all that, the funny thing is that I don't even like blondies. I mean, my dessert motto is the only thing better than chocolate is double chocolate. 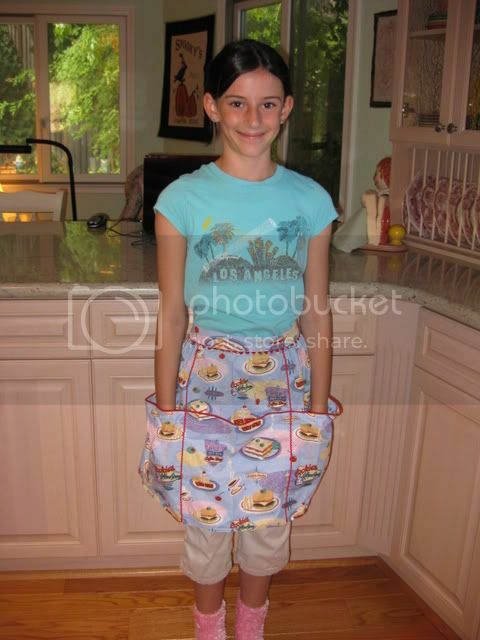 But your daughter and her apron are just so adorable! Let's remember that someone over at CTM is on a serious DIET...this is killing me. When my kids were little, we always made Blondies. Your daughter looks like she has a promising future in the kitchen. One of those blondies would be just great with my coffee this morning. I just remembered that my son/DIL bought me Gone With the Wind for my birthday last April. I found it unopened and watched it this weekend. I LOVE blondies but have never made them. I'm going to have to give them a go......and miss blondie maker is as adorable as ever.